Carrieres de Lumieres is a venue unlike any other for this dazzling sound and light display. The sound and light show in Les Baux-de-Provence is housed in an old bauxite quarry called Carrieres de Lumieres (loosely translated as Quarry of Light). The venue is a cross between museum and theater with a show that changes each year. The 40-minute installation running through January 5, 2014 is called Monet, Renoir…Chagall: Journeys around the Mediterranean. As you enter the cavernous space carved into the hillside, your eyes adjust slowly to the darkness. One hundred projectors display 3000 images covering 50 years of work by 16 French artists; ranging from impressionism, to Fauvism, to contemporary pieces—all related to the theme of the Mediterranean coast. The multimedia production is accompanied by classical and contemporary music. The works at this “multiplex” aren’t projected onto conventional screens. Instead, they cover the quarry walls at heights of more than 45 feet from ground to ceiling. LED technology makes the walls come alive with the illusion of movement. There are no seats, per se. Visitors walk around, viewing the changing images from different vantage points as their own shadows are eerily cast on the paintings. Sitting on a few concrete slabs around the perimeter, some visitors huddle together for warmth. Others sit atop a carpet of landscapes and seascapes projected on the ground, with their children dancing beside them. The quarry stands at the bottom of a narrow winding road leading up to a little village considered one of the most beautiful in France: Les Baux-de-Provence. Nestled in Provence’s Alpilles mountain range, it is a ten-minute walk from the quarry. Visitors can explore the ruins of the old castle fortress (Chateaux de Baux) and church that dominated the region for centuries. Now, only twenty-two residents live in the picturesque village but its stone buildings have been beautifully restored. Tourists from all over the world arrive by car or bus to browse the art galleries and shops, eat at cafes, and to soak in the spectacular views of the lavender-filled plains below. 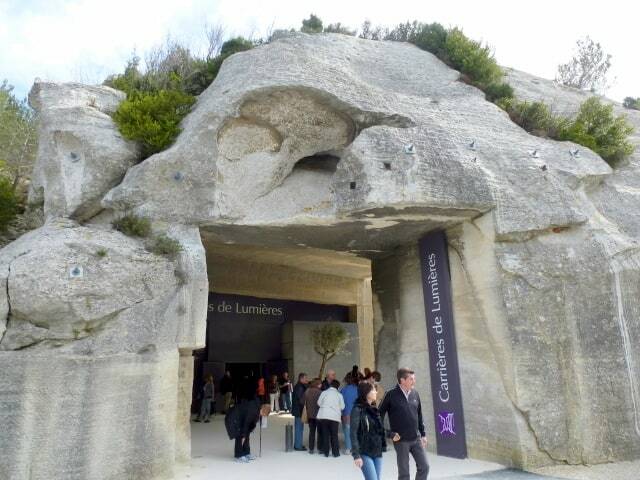 Carrieres de Lumieres, in Les Baux-de-Provence is open every day (Hours change seasonally). By road: motorway A7 (exit Avignon), A9 (Nîmes) and A54 (Baux-de-Provence); By train: Aix-en-Provence and Avignon TGV stations. This post is part of a travel linkup on Noel Morata’s Travel Photo Mondays. What a wonderful attraction, I love multi-art presentations like this so inventive…happy New Years to you!